Verrucas & Warts – Happy Health Clinics! Verrucas are easy enough to recognise – small, white circular patches of abnormally thick skin on the sole of the foot. Often, they have several black spots at their centre, caused by clotted blood vessels. Normally, a verruca won’t cause problems, but if it’s on a weight-bearing part of the foot, it can be painful and a layer of hard skin is likely to form over it, making the problem worse. Because verrucas are caused by a viral infection (unlike a corn or callus, which is just layers of dead skin), they can easily spread to other parts of the foot, or form unsightly clusters called a mosaic verruca. Although most verrucas will eventually disappear of their own accord. The key word here is ‘eventually’ – verrucas are notorious for being difficult to get rid of, and they can easily last for years, or even decades. To clear the condition more quickly, action is needed. Verrucas are caused by the same common virus that causes warts. In fact, a verruca is simply a wart on the foot. Although the virus that causes a verruca is the Human Papilloma Virus (HPV), which is linked to cervical and penile cancer, it’s important to realise that there are over 100 different types of HPV, and the type of HPV that causes verrucas is not the same as the type that leads to cervical and penile cancer. When the verruca virus infects skin, it causes excessive production of a protein called keratin (which is also a key component of hair and nails), resulting in a hard and rough skin texture. It’s not fully understood why some people get verrucas and others don’t – though it is known that verrucas are highly contagious. Communal areas where people often put bare feet in contact with the floor (such as showers or changing rooms) are typical of places where you can easily pick up the virus. Someone with a verruca walking barefoot across a floor my deposit infected skin cells on the floor. Anyone who then walks barefoot on this surface – especially if they have small cuts or abrasions on the sole of their feet is at high risk of picking up the virus. It’s also important not to share shoes, socks or towels with somebody who has a verruca, as cross infection can happen this way. When you’re in damp communal areas, make sure your feet are covered – flip flops are an inexpensive and effective precaution. Don’t share socks, shoes or towels with someone who has a verruca. Cover cuts and abrasions on your feet with a sticking plaster. Although some may feel embarrassed or self-conscious when wearing verruca (rubber) socks, they’re a great way to reduce the spread of infection – and great protection, too. 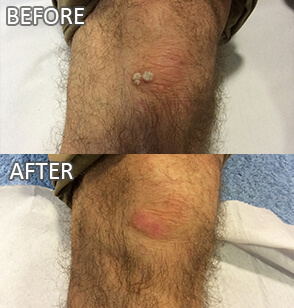 The two most common treatments for verrucas are salicylic acid and cryosurgery (freezing). This works by breaking down the infected tissue thereby destroying the virus. In clinic the hardened skin is removed with a surgical blade and then the acid is applied. This treatment needs to be applied regularly and it can take several sessions before the foot is clear. This involves freezing the verruca with extremely low temperatures. This destroys the blood vessels that supply the verruca, so that it ‘dies’. The effectiveness of the treatment (usually repeated at two-week intervals) varies from patient to patient, with some requiring just a few sessions and some a protracted series. The process can produce discomfort and can cause blistering. But high heels can also cause the formation of calluses. This is because, normally, the weight of the body (when standing) is distributed over both the balls and heels of the feet. High heels change this weight distribution so that more of the body’s weight is supported by the balls of the feet. This excessive pressure often results in calluses. Applying duct tape to the verruca over a period of time has been found to be helpful, though there is little scientific evidence to suggest why this should be an effective treatment. The chemical glutaraldehyde has been used with positive effect, though it can temporarily stain the skin brown. Another chemical, silver nitrate, can be effective, though it may produce a burning effect. Dinitrochlorobenzene can cause an immune response that kills the verruca. However, little research has been done on this treatment and we advise extreme caution when using it as it is known to cause genetic mutations. Surgery may also be considered. Nevertheless success is not guaranteed and scarring may result. Some have found Tea Tree oil helps, but there is no clear medical evidence of how effective this is.